Danganronpa 2: Goodbye Despair[b] is a visual novel adventure video game developed by Spike Chunsoft. It is the second installment in the Danganronpa series, and a direct sequel to the 2010 game Danganronpa: Trigger Happy Havoc. It was first released in Japan for the PlayStation Portable on July 26, 2012. A port for the PlayStation Vita was released in Japan on October 10, 2013 and was published in North America and Europe by NIS America in September 2014. A port for Microsoft Windows was released on April 18, 2016. The game was released alongside the original for PlayStation 4 in March 2017. The story follows a group of high school students who are trapped on an island by their high school's headmaster Monokuma, a sentient stuffed bear. In order to leave the island, a student must kill one of their peers, and not be caught in the subsequent investigation and trial. 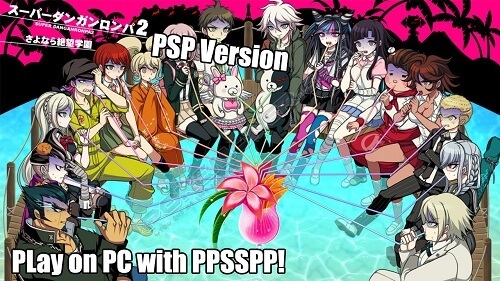 Similar to the previous game, Danganronpa 2 features two main styles of gameplay; School Life, which is split into Daily Life and Deadly Life sections, and the Class Trial. In the Daily Life section, players interact with other characters and progress through the plot. Conversing with characters during 'Free Time' sections earns Hope Fragments, which can be exchanged for skills that can be used in the Class Trial. Performing various interactions increases the player's level, allowing them to equip more skills during trials. Monocoins, earned by finding hidden Monokuma Figures or performing well in trials, can be exchanged for presents that can be given to other characters during Free Time segments, with certain items able to trigger special events. The Deadly Life section, which occurs when a crime scene is discovered, has the player search for evidence that will assist them in the Class Trial. The Class Trial, in which players must determine the identity of a culprit, features the same aspects as the previous game, but with new gameplay elements. 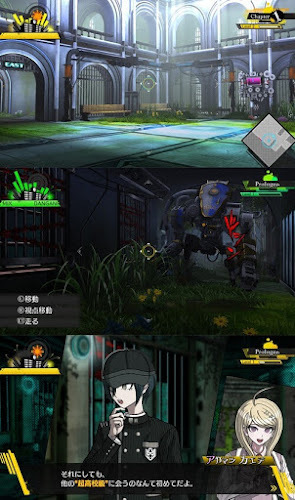 Like before, Class Trials are largely formed of Nonstop Debates, in which players must look for weak points in the students' discussion and shoot them with "Truth Bullets" that contradict them. This time around, the yellow-colored 'Argue Spots' are joined by blue-colored 'Agree Spots', which must be shot with a Truth Bullet indicating someone is telling the truth. Hangman's Gambit now requires players to combine matching letters coming in from both sides of the screen before they collide into incorrect matches. Combined letters may then either be destroyed, or used to spell out the clue. The Bullet Time Battle from the previous game is now known as Panic Talk Action, featuring largely the same mechanics of using rhythmic timing to break through a student's mental defenses. Controls are revised slightly from the last game, and players must now spell out a phrase in the correct order at the end of the section, rather than firing a specific Truth Bullet. Finally, the Closing Argument, in which players fill out a comic strip depicting the events of a crime, is adjusted so that players select panels from stocks of panels, as opposed to having access to all the pieces at once. Various new gameplay elements have been added to the Class Trial. Rebuttal Showdowns take place when a student attempts to refute the player's logic. In these sections, players must slash apart their opponent's argument to gain dominance in the conversation and reveal new information, before using a "Truth Blade" to strike through the correct weak point when it appears. Logic Dive is a snowboarding minigame, in which players steer down a logical tube whilst avoiding obstacles and pitfalls, occasionally choosing between multiple routes based on a question given, in order to arrive at a logical conclusion. Finally, Spot Select requires players to examine an image and indicate an important spot. There are also various modes outside the main game. Players have a virtual pet that can be accessed from the pause menu, which grows as players take steps in the game and earns the player rewards based on its Hope and Despair stats. Magical Girl Miracle☆Monomi is a minigame in which players control Monomi fighting off against waves of cute monsters. Island Mode, which is available after clearing the game once, is an alternate mode where the students are not subjected to Monokuma's killing game and instead aim to make friends with each other and earn Hope Fragments. This allows players to bond with characters more easily than in the main story mode. Danganronpa IF, a short story depicting an alternate storyline for Danganronpa: Trigger Happy Havoc, is also unlocked after clearing the game once.